Numerical modeling provides well-established tools for advancing in water management. 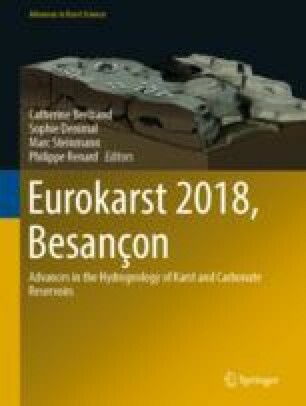 In this study, a simplified version of the semi-distributed VarKarst approach has been developed to reduce modeling routine and, therefore, the time of calculation needed for jointly simulating spring discharge and piezometric head variations in the same karst system located in southern Spain. Simulated spring outflows were compared with spring flow data derived from a previous application of the original VarKarst. Scatter correlation of spring flows yields Kling-Gupta efficiency (KGE) and a Pearson’s coefficient (R2) of 0.90 and 0.89, respectively. The modified approach includes new equations that consider the distance between sea level and the basement of the aquifer, from which the piezometric-level variations were calculated. The KGE, R2, and the root-mean-squared error results obtained of groundwater level were 0.79, 0.85, and 3.07 m, respectively. We conclude that the simplified VarKarst numerical code can provide realistic hydrodynamic results in the karst system, as original VarKarst, concerning both discharge and groundwater level dynamics. This capacity of simulation could help to reduce uncertainty in model routines. This chapter is a contribution to the project CGL2015-65858R and to the research group 308 of Andalusian Government. Jimenez-Martinez, J, Smith, M, Pope, D (2016) Prediction of groundwater induced flooding in a chalk aquifer for future climate change scenarios, Hydrol. Process., 30, 573–587. https://doi.org/10.1002/hyp.10619, 2016. Ladouche, B, Marechal, JC, Dorfliger, N (2014) Semi-distributed lumped model of a karst system under active management, J. Hydrol., 509, 215–230. https://doi.org/10.1016/j.hydrol.2013.11.017. Vrugt JA, ter Braak CJF, Clark MP, Hyman JM, Robinson BA (2008) Treatment of input uncertainty in hydrologic modeling: Doing hydrology backward with Markov chain monte Carlo simulation. Water Resources Research, 44: W00B09. https://doi.org/10.1029/2007wr006720.